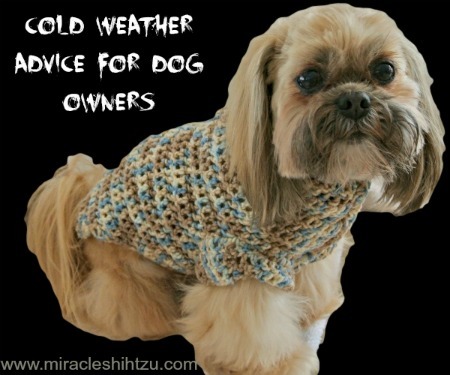 Cold weather advice is something most Shih Tzu owners do not think they need. After all, their little Shih Tzu is not a bald Chinese Crested or a Mexican Hairless. Our dogs have hair and lots of it. We live in a part of the world where winters can be harsh and even though our dogs love the snow, they can still resist going out when the temperatures plummet below zero degrees Fahrenheit. Here is a video about Hanna and a Cold Snowy Day. We hope you enjoy it. Once you've viewed the video, you might want to read more about Shih Tzu care in the wintertime. Hanna was a puppy at the time and has since grown into an excellent adult and Mama of her own. Shih Tzu dogs were developed in Tibet and China where environments are similar. Tibet has colder temperatures due to higher altitudes than China. Winters in Tibet are cold with an average January temperature hovering around -2°C. In China, temperatures range from icy to warm depending on the location. The original Shih Tzu that were bred and developed in China experienced cooler climates, making them adaptable to modern day cold climates and winter temperatures. Frostbite is a possibility even in dogs. Keep that in mind when you're out for long periods of time. Shih Tzu dogs should never be left outside. They are strictly house dogs. Here is some cold weather advice for keeping your Shih Tzu Healthy, Happy, and Comfortable in the wintertime. To keep your Shih Tzu from picking up ice and snow on her feet, trim the hair around the bottom of the feet, and remove any hair between paw pads were ice can accumulate. If Shih Tzu dogs have a long coat, they are probably OK to go outside without a coat or sweater. If you trim your Tzu, a sweater or coat is highly advised. Some folks will also purchase doggie boots for outdoor walks. Remember that antifreeze may taste good to a dog but it can be lethal. If you walk your dog where there is a lot of rock salt, rinse them off when you return. The salt can irritate the pads of the foot. If you use salt on your driveway or path, purchase the dog-friendly type that won't hurt your dog. Never allow your dog to remain outdoors for long during low temperature. They can get frostbitten the same as you. If your dog is covered with snow or wet, either towel dry or use a blow dryer to warm them once they return from outside.